LKQ SKU: LKQ210 ~192254272 THB61001. This is NOT a manufacturer part number, and can be disregarded. We do our best to prevent these issues from happening and apologize for any inconvenience it may cause. FOR SALE WE HAVE A 2005 2006 ACURA RSX-S OEM FACTORY THROTTLE BODY ASSEMBLY PRB DC5 K20Z1 #4262. THIS ITEM IS USED AND MAY SHOW SIGNS OF IMPERFECTIONS SUCH AS SURFACE SCRATCHES AND SCUFFS. -IF A ITEM HAS BEEN ALTERED OF ITS PHYSICAL AND FUNCTIONAL FORM IN ANY WAY, IT VOIDS TAE AUTHENTICITY. FOR SALE WE HAVE A 2004 04 ACURA RSX-S OEM FACTORY THROTTLE BODY ASSEMBLY K20A2 DC5 #4276. THIS ITEM IS USED AND MAY SHOW SIGNS OF IMPERFECTIONS SUCH AS SURFACE SCRATCHES AND SCUFFS. -IF A ITEM HAS BEEN ALTERED OF ITS PHYSICAL AND FUNCTIONAL FORM IN ANY WAY, IT VOIDS TAE AUTHENTICITY. FOR SALE WE HAVE A 2003 03 ACURA RSX-S OEM FACTORY THROTTLE BODY ASSEMBLY DC5 K20A2 PRB #4134. ITEM IS IN GOOD CONDITION AND FULL WORKING ORDER.THIS ITEM IS USED AND MAY SHOW SIGNS OF IMPERFECTIONS SUCH AS SURFACE SCRATCHES AND SCUFFS. LKQ SKU: LKQ749 ~211844300 THB60996. This is NOT a manufacturer part number, and can be disregarded. We do our best to prevent these issues from happening and apologize for any inconvenience it may cause. OBX Racing Sports Throttle Body (1pc). 2002-2006 Acura RSX Base/S 2.0L K20A2/K20A3/K20Z. 2002-2005 Honda Civic SI Hatchback 2.0L K20A3. Billet 6061-T6 aluminum throttle body. Increase airflow to improve horsepower, torque, and throttle response. FOR SALE WE HAVE A 02 03 04 ACURA RSX-S OEM FACTORY THROTTLE BODY ASSEMBLY DC5 K20A2 #4155. ITEM IS IN GOOD CONDITION AND FULL WORKING ORDER.THIS ITEM IS USED AND MAY SHOW SIGNS OF IMPERFECTIONS SUCH AS SURFACE SCRATCHES AND SCUFFS. LKQ SKU: LKQ117 ~206489607 THB60996. This is NOT a manufacturer part number, and can be disregarded. We do our best to prevent these issues from happening and apologize for any inconvenience it may cause. LKQ SKU: LKQ160 ~207424851 THB61001. This is NOT a manufacturer part number, and can be disregarded. We do our best to prevent these issues from happening and apologize for any inconvenience it may cause. 02-06 ACURA RSX TYPE-S 70MM THROTTLE BODY. This 70mm throttle body optimizes more airflow to the K20 engine. – 2002 2003 2004 2005 2006 ACURA RSXTYPE-S ONLY. These units are good for huge horsepower increase along with improved throttle response. The Skunk2 Racing Pro-Series Billet Throttle Body increases horsepower and torque by optimizing airflow to your engine. On forced induction applications, this quick bolt-on has shown gains of 50 HP. FOR SALE WE HAVE 2004 04 ACURA RSX-S OEM FACTORY THROTTLE BODY ASSEMBLY DC5 K20A2 PRB #4183. THIS ITEM IS USED AND MAY SHOW SIGNS OF IMPERFECTIONS SUCH AS SURFACE SCRATCHES AND SCUFFS. -IF A ITEM HAS BEEN ALTERED OF ITS PHYSICAL AND FUNCTIONAL FORM IN ANY WAY, IT VOIDS TAE AUTHENTICITY. FOR SALE WE HAVE A 2005 05 ACURA RSX-S OEM FACTORY THROTTLE BODY ASSEMBLY DC5 K20Z1 PRB #4270. THIS ITEM IS USED AND MAY SHOW SIGNS OF IMPERFECTIONS SUCH AS SURFACE SCRATCHES AND SCUFFS. -IF A ITEM HAS BEEN ALTERED OF ITS PHYSICAL AND FUNCTIONAL FORM IN ANY WAY, IT VOIDS TAE AUTHENTICITY. FOR SALE WE HAVE A 02-04 ACURA RSX-S OEM FACTORY THROTTLE BODY ASSEMBLY K20A2 DC5 #4286. THIS ITEM IS USED AND MAY SHOW SIGNS OF IMPERFECTIONS SUCH AS SURFACE SCRATCHES AND SCUFFS. -IF A ITEM HAS BEEN ALTERED OF ITS PHYSICAL AND FUNCTIONAL FORM IN ANY WAY, IT VOIDS TAE AUTHENTICITY. FOR SALE WE HAVE A 2006 06 ACURA RSX-S OEM FACTORY THROTTLE BODY ASSEMBLY DC5 PRB K20Z1 #4174. ITEM IS IN GOOD CONDITION AND FULL WORKING ORDER.THIS ITEM IS USED AND MAY SHOW SIGNS OF IMPERFECTIONS SUCH AS SURFACE SCRATCHES AND SCUFFS. FOR SALE WE HAVE A 2005-2006 ACURA RSX-S K20Z1 OEM FACTORY ENGINE THROTTLE BODY DC5 ASSY #4314. THIS ITEM IS USED AND MAY SHOW SIGNS OF IMPERFECTIONS SUCH AS SURFACE SCRATCHES AND SCUFFS. ANY ISSUE WITH OUR USED PRODUCT FOR WARRANTY PURPOSES MUST BE STATED ON A VAILD RECIPT FROM ASE CERTIFIED REPAIR FACILITY. LKQ SKU: LKQ754 ~212238144 THB60996. This is NOT a manufacturer part number, and can be disregarded. We do our best to prevent these issues from happening and apologize for any inconvenience it may cause. FOR SALE WE HAVE A 02-04 ACURA RSX-S OEM FACTORY THROTTLE BODY ASSEMBLY K20A2 PRB #4229. THIS ITEM IS USED AND MAY SHOW SIGNS OF IMPERFECTIONS SUCH AS SURFACE SCRATCHES AND SCUFFS. -IF A ITEM HAS BEEN ALTERED OF ITS PHYSICAL AND FUNCTIONAL FORM IN ANY WAY, IT VOIDS TAE AUTHENTICITY. FOR SALE WE HAVE A 2005 05 ACURA RSX-S OEM FACTORY THROTTLE BODY ASSEMBLY K20Z1 DC5 PRB #4283. THIS ITEM IS USED AND MAY SHOW SIGNS OF IMPERFECTIONS SUCH AS SURFACE SCRATCHES AND SCUFFS. -IF A ITEM HAS BEEN ALTERED OF ITS PHYSICAL AND FUNCTIONAL FORM IN ANY WAY, IT VOIDS TAE AUTHENTICITY. LKQ SKU: LKQ117 ~204191276 THB61001. This is NOT a manufacturer part number, and can be disregarded. We do our best to prevent these issues from happening and apologize for any inconvenience it may cause. IT IS OUT OF A 2005 ACURA RSX BASE 2 DOOR HATCHBACK WITH A 2.0L ENGINE DOHC I-VTEC 5 SPEED AUTO TRANSMISSION. RSX 05-06 Canada market, premium, AT = AUTOMATIC TRANSMISSION. RSX 05-06 US market, Base, AT = AUTOMATIC TRANSMISSION. FOR SALE WE HAVE A 2006 06 ACURA RSX-S OEM FACTORY THROTTLE BODY ASSEMBLY K20Z1 DC5 PRB #4282. THIS ITEM IS USED AND MAY SHOW SIGNS OF IMPERFECTIONS SUCH AS SURFACE SCRATCHES AND SCUFFS. -IF A ITEM HAS BEEN ALTERED OF ITS PHYSICAL AND FUNCTIONAL FORM IN ANY WAY, IT VOIDS TAE AUTHENTICITY. FOR SALE WE HAVE A 2003 ACURA RSX-S OEM FACTORY THROTTLE BODY ASSEMBLY DC5 K20A2 PRB #4142. ITEM IS IN GOOD CONDITION AND FULL WORKING ORDER.THIS ITEM IS USED AND MAY SHOW SIGNS OF IMPERFECTIONS SUCH AS SURFACE SCRATCHES AND SCUFFS. FOR SALE WE HAVE A 2006 06 ACURA RSX-S OEM FACTORY THROTTLE BODY ASSEMBLY DC5 K20Z1 PRB #4267. THIS ITEM IS USED AND MAY SHOW SIGNS OF IMPERFECTIONS SUCH AS SURFACE SCRATCHES AND SCUFFS. -IF A ITEM HAS BEEN ALTERED OF ITS PHYSICAL AND FUNCTIONAL FORM IN ANY WAY, IT VOIDS TAE AUTHENTICITY. FOR SALE WE HAVE A 2002 02 ACURA RSX-S OEM FACTORY THROTTLE BODY ASSEMBLY DC5 K20A2 #4129. ITEM IS IN GOOD CONDITION AND FULL WORKING ORDER.THIS ITEM IS USED AND MAY SHOW SIGNS OF IMPERFECTIONS SUCH AS SURFACE SCRATCHES AND SCUFFS. Fits: 2002-2006 Acura RSX K20A3. this is the throttle body from a 2002 Acura RSX K20A3. Parts are used so wear and tear is expected. FOR SALE WE HAVE A 2005 05 ACURA RSX-S OEM FACTORY THROTTLE BODY ASSEMBLY K20Z1 DC5 PRB #4141. ITEM IS IN GOOD CONDITION AND FULL WORKING ORDER.THIS ITEM IS USED AND MAY SHOW SIGNS OF IMPERFECTIONS SUCH AS SURFACE SCRATCHES AND SCUFFS. 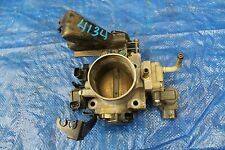 FOR SALE WE HAVE A 2003 03 ACURA RSX-S OEM FACTORY THROTTLE BODY ASSEMBLY DC5 K20A2 PRB #4257. THIS ITEM IS USED AND MAY SHOW SIGNS OF IMPERFECTIONS SUCH AS SURFACE SCRATCHES AND SCUFFS. -IF A ITEM HAS BEEN ALTERED OF ITS PHYSICAL AND FUNCTIONAL FORM IN ANY WAY, IT VOIDS TAE AUTHENTICITY. 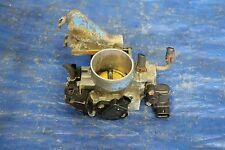 FOR SALE WE HAVE A 2003 03 ACURA RSX-S OEM FACTORY THROTTLE BODY ASSEMBLY PRB DC5 K20A2 #4206. THIS ITEM IS USED AND MAY SHOW SIGNS OF IMPERFECTIONS SUCH AS SURFACE SCRATCHES AND SCUFFS. -IF A ITEM HAS BEEN ALTERED OF ITS PHYSICAL AND FUNCTIONAL FORM IN ANY WAY, IT VOIDS TAE AUTHENTICITY. FOR SALE WE HAVE A 02-04 ACURA RSX-S OEM FACTORY THROTTLE BODY ASSEMBLY K20A2 PRB DC5 #4203. THIS ITEM IS USED AND MAY SHOW SIGNS OF IMPERFECTIONS SUCH AS SURFACE SCRATCHES AND SCUFFS. -IF A ITEM HAS BEEN ALTERED OF ITS PHYSICAL AND FUNCTIONAL FORM IN ANY WAY, IT VOIDS TAE AUTHENTICITY. FOR SALE WE HAVE A 2003 03 ACURA RSX-S OEM FACTORY THROTTLE BODY ASSEMBLY DC5 K20A2 PRB #4128. ITEM IS IN GOOD CONDITION AND FULL WORKING ORDER.THIS ITEM IS USED AND MAY SHOW SIGNS OF IMPERFECTIONS SUCH AS SURFACE SCRATCHES AND SCUFFS. LKQ SKU: LKQ150 ~181720824 THB61001. This is NOT a manufacturer part number, and can be disregarded. We do our best to prevent these issues from happening and apologize for any inconvenience it may cause. LKQ SKU: LKQ530 ~204093575 THB61001. This is NOT a manufacturer part number, and can be disregarded. We do our best to prevent these issues from happening and apologize for any inconvenience it may cause.